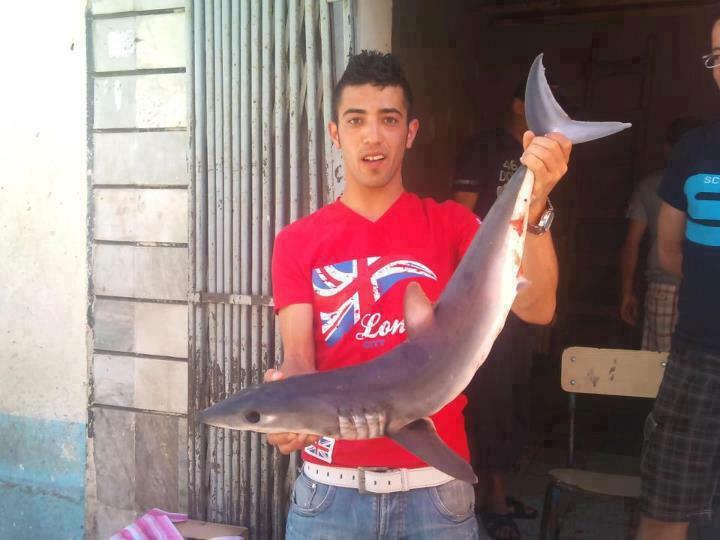 The following provides a supplement and continuation of our previous post from 01 May 2012 Notable Recent Shark Catches from the Mediterranean Sea. Seventeen Recent Shark Records from the Mediterranean and European Region. Species: Blue shark ( Prionace glauca ). Size: said to be over 2 metres in length. The blue shark was found beached near the campsite Quattro Mori on the south-eastern coast of Sardinia. 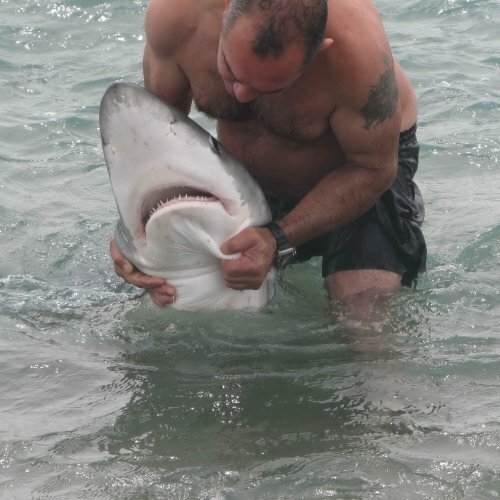 The source is reporting that the shark was violently attacking a man, who tried to save the animal. The victim (Giorgio Zara, 57) suffered injuries to his leg and was transferred to the hospital San Marcellino. The shark died very shortly after the incident. Source and Photo Credit: L’Unione Sarda. Location: Denmark (Place of catch unknown). Species: Porbeagle shark ( Lamna nasus ). Size: said to be 100 kg in weight. A supermarket in Them (Silkeborg municipality) bought this specimen from a fishmonger, who had obtained it from a fish auction in Hirtshals. 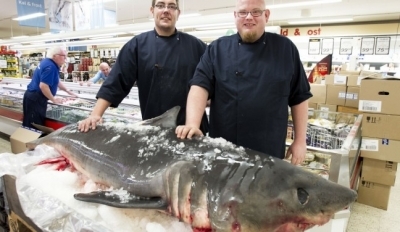 The shark steaks were sold for 100 kr. per kilo. The news source does not reveal the place of catch. Date: reported on 01. June 2012. Location: Collo, Skikda Province, Algeria. Species: Shortfin mako shark ( Isurus oxyrinchus ). Date: reported on 27. May 2012. Species: Smalltooth sandtiger shark ( Odontaspis ferox ). Size: said to be 3.5 metres in length, and at least 300 kg in weight. A record from the Aegean Sea. 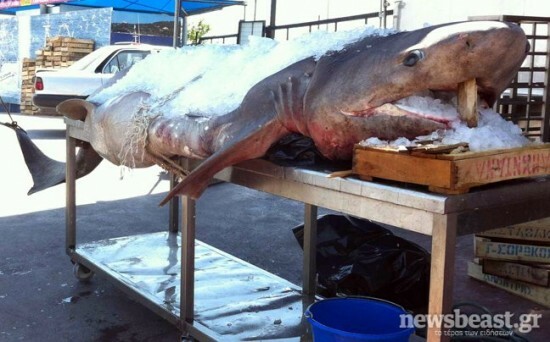 According to the source, the fisherman found the shark entangled in his net in the morning of May 27th . We have already posted a video of the specimen in our Video Section (here). Source and Photo Credit: Info-Milos (Portal of Milos). Date (of catch): 26. May 2012. Location: Bougaroune, Collo, Skikda Province, Algeria. Size: said to be 1.8 metres in length and 95 kg in weight. Date: reported on 23. May 2012. Location: Lofoten, Nordland County, Norway. Species: Basking shark ( Cetorhinus maximus ). Size: said to be 10 metres in length and 10 tons in weight. The shark was accidentally caught in a drift net in the waters off the village of Stamsund. It was already dead when the net was retrieved. The 13 metres long fishing vessel “Nordhaug Senior” towed the huge catch to the dock of the Jangaard Export AS factory. Source: Lofotposten. Photo Credit: Kai Nikolaisen. 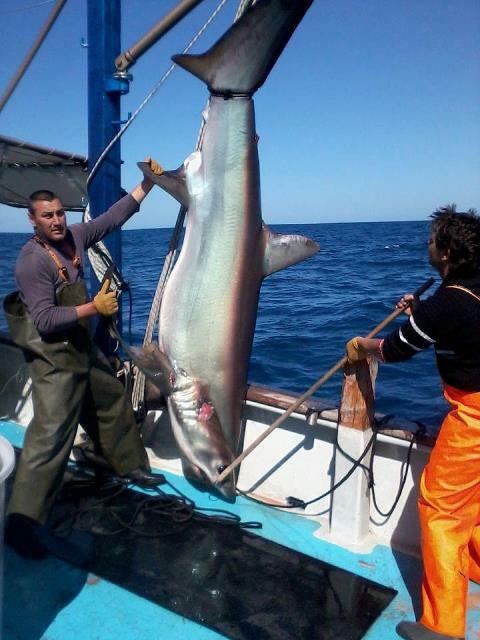 Species: Porbeagle shark (Lamna nasus). On May 21st, the shark was caught as bycatch in the waters off Andøya, the northernmost island in the archipelago of Vesterålen. 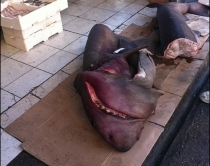 It was sold to a fishmonger in Os, where the photo (below) was taken. Photo Credit: Kjetil Vasby Bruarøy. Date: reported on 12. May 2012. Size: 94 kg in weight. 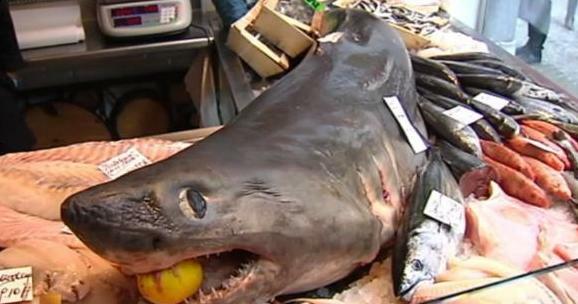 The photo was taken at a fishmonger’s shop in the Flemish city of Leuven, Belgium. According to the source, the porbeagle had been caught in the waters off Bergen in Norway on May 9th. You can see a related news-video here. Date: reported on 11. May 2012. Location: Selimiye, Marmaris District, Muğla Province, Turkey. Species: Thresher shark ( Alopias vulpinus ). 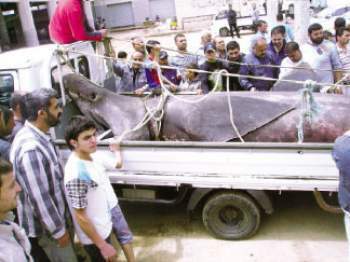 Size: said to be 4.5 metres in length and 250 kg in weight. 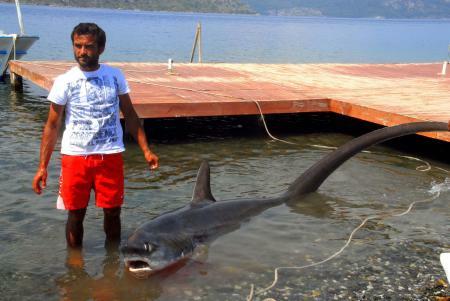 The Turkish fisherman, from the village of Selimiye, was operating in international waters off the Greek island of Symi in the south-eastern Aegean Sea. He used hook and line as fishing gear. It is reported that the shark died during the 4.5 hours long fight on the fishing line. Source and Photo Credit: Milliyet. Date: reported on 10. May 2012. 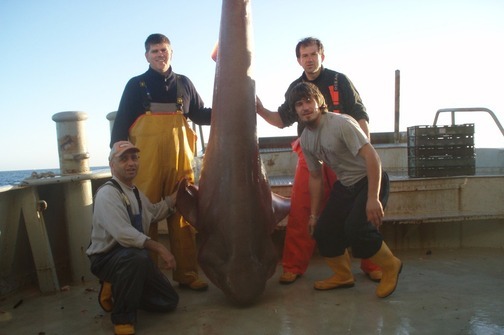 Species: Bluntnose sixgill shark ( Hexanchus griseus ). Size: said to be about 3 metres in length and 330 kg in weight. The specimen was accidentally caught in the net of a ‘shrimp trawler’ in the Adriatic Sea. Source and Photo Credit: 24sata. Date: reported on 05. May 2012. Size: said to be 5 metres in length ( most likely on overestimate ). The photo was taken at a market in Tirana, the capital and largest city of Albania. The source is reporting that the catch of this specimen took place in the south of the country. Size: almost 3 metres is length, about 300 kg in weight. 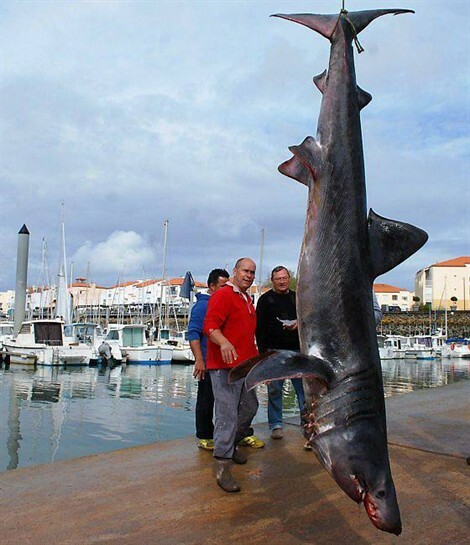 A record from the French Atlantic coast. 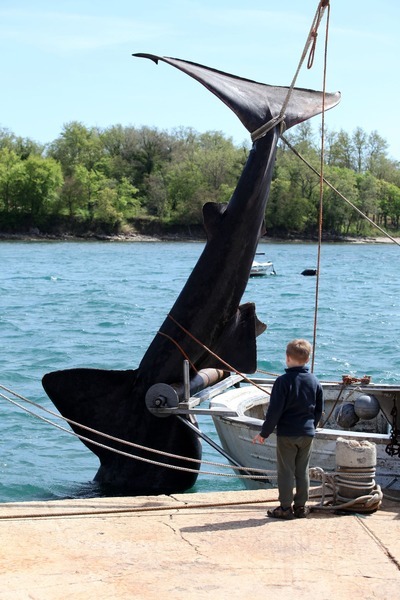 In the late morning of May 5th, a sole fisherman retrieved the dead shark (presumably injured by propeller blades) from the waters off Port Olona. Date: reported on 04. May 2012. Size: said to be 250 kg in weight. Date: reported on 03. May 2012. Size: said to be almost 7 metres in length and ca. 3 tons in weight. 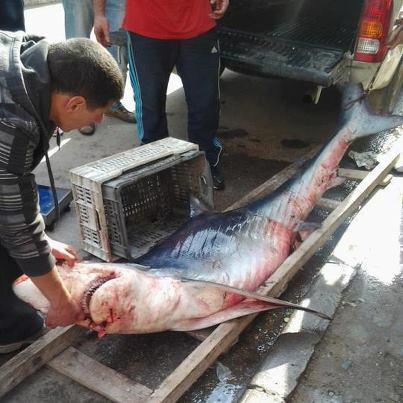 The shark was accidentally caught in a gillnet north of Latakia, the principal port city of Syria. According to another source (M.Jony), the catch of this specimen occurred on 21. April 2012. It is also said to be the first record of this species from Syria. Date: reported on 30. April 2012. Size: said to be about 4 metres in length. The photo was taken in Amygdaleza ( a suburb of Athens ). The place of catch is located off Crete Island. Date: reported on 28. April 2012. Size: said to be 9 metres in length and 2 tons in weight. A record from the Adriatic Sea. Fishermen caught this specimen in the waters off Porec, located on the western coast of the Istrian peninsula. Source and Photo Credit: Telegraf. Date: reported on 24. April 2012. 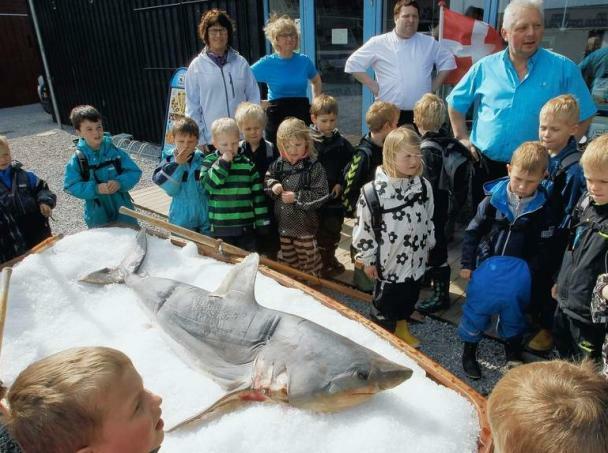 The photo was taken in front of the Limfjordens Hus Restaurant in Glyngøre, where they served the shark meat at 148,- kr. per portion. 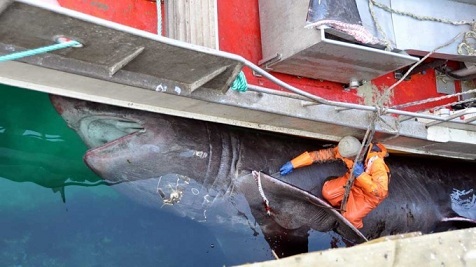 The source is reporting that the porbeagle was delivered from Hanstholm, located in the northern part of Denmark. Source and Photo Credit: Morsø Folkeblad, Facebook. These images are very sad, it is clear that despite all the work that we do to educate the world how important sharks are to this world, many people still think it is good to kill sharks. We clearly need more laws in this world. I live in a small town in Canada call Pickering, we are nowhere near an ocean but yet, we have a shark fin ban here. Please dont be discouraged by these. All of your work, thoughts helps to sharks. These pictures are nothing as compared to what actually is caught in this time frame in the same area. Only a small portion of them are brought to shore. Europe is not like Japan or China, Sharks are not on their menu. 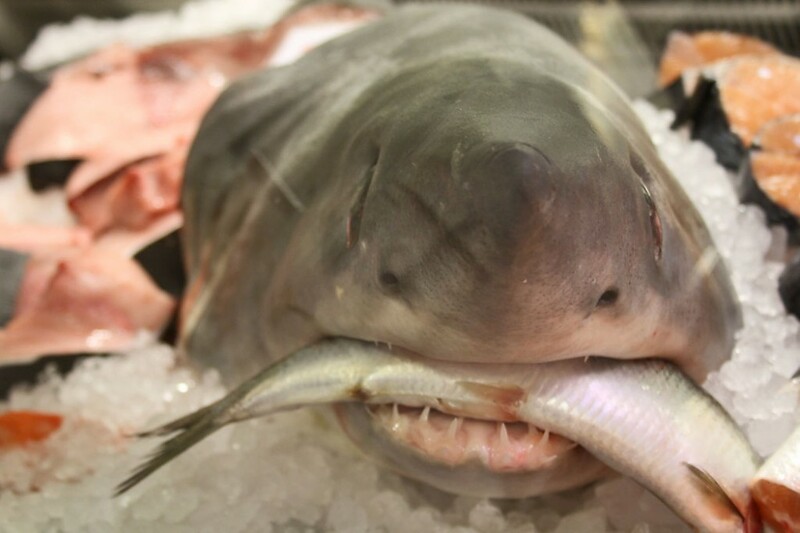 Except a few locations, only local small village foods may contain shark. That is it. So if you can stop the shark finning to be exported to far east, European shark catch will be tolarable actually hopefully sustainable as well. The problem is the size of their fishing fleet. In combination that is the largest fleet on the planet. Even in the name lf bay catch, they will still kill a lot of sharks. So everything we do is helping the sharks. Even writing here on this informative web site. Some people are reading… it is helping… We shall all see in near future..
http://sharksingreece.blogspot.gr/ Check this blog about the sharks in Greece. Cry me a river, smelly hyppies! Even if I was capable to feel sympathy for these hellspawns that have killed 8 of my compatriots, it’s not like we commercially exploit or hunt down sharks for sport like you spoiled thrill seeking mammary exposing western d-generates. These gluttonous stupid mother’s are just trapped in our webs while trying to steal our catch. Unfortunately for us and for actually endagered species that are being preyed by them, like Loggerhead Turles and Monk Seals, these cosmopolitan scourges of the sea are not going to be reduced in numbers, at least not in our waters. Now shut your whiny mouth and go overdose on Marijuana or something and let us do our honest living, okey?